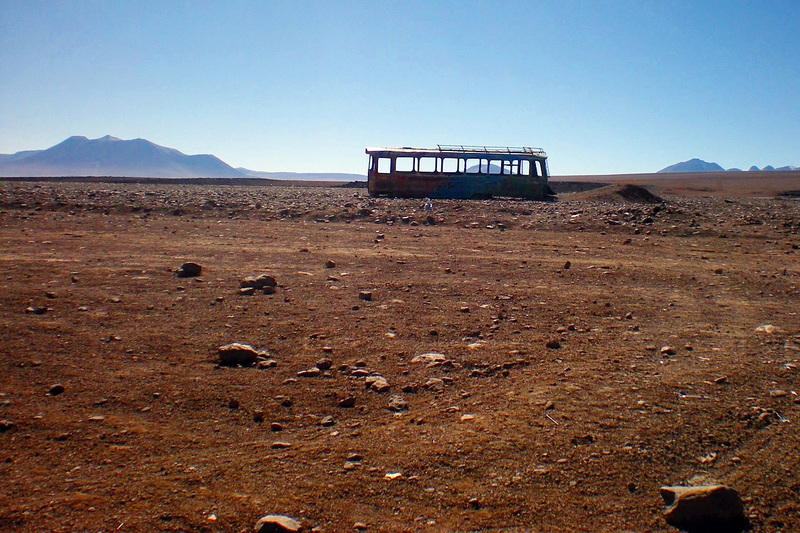 Leaving Uyuni behind, we head southwest toward the desert of Chiguana. Sand, shrubs and the occasional llama are our only companions here in one of the most underdeveloped areas of Bolivia. Fuel continues to be a challenge as all of the stations along our route are not permitted to serve foreigners. Thankfully, we attract the curiosity of the children in a small village and they lead us to their home, where a much-needed container of fuel is stored under the kitchen table. Of course, where else would you keep it? The lady-of-the-house kindly obliges and accepts our payment for her petrol. We now have everything that we need to make our run into Chile. As we come closer to the border, we enjoy views of the semi-active and still smoking Ollague Volcano and the many interesting rock formations it has created in the area. Getting through the Bolivian side of the border is a slow process, but we are kept entertained by exploring several old rail cars parked along the border. The Chilean side is even slower, regardless of the fact that we are the only travelers there. After a couple of hours, we are on our way and excited to leave the rough roads of Bolivia behind us. Our joy is short-lived. Although we’ve heard endless stories of the fabulous road system in Chile, it seems that system hasn’t made its way to this remote corner. Ahead, we face the roughest roads we have encountered on our trip. Our extremely slow travel puts us in a great spot to witness a spectacular sunset across the Atacama Desert, but it also means that we roll into our stop for the night, Calama, in the wee hours of the morning. Compared to the bargain pricing of Bolivia, the accommodation rates in Chile catch us by surprise, but we don’t put up much of a fight, willing to pay pretty much whatever price is asked so that we can turn of our engine and rest our beat up bodies. Once again, we’ve ended up in a “Luuuuv” hotel. We try to ignore the enormous hot tub that dominates the room, but in the morning it’s too much to resist and our first full day in Chile begins with a long, hot soak.